Need to Vent! — Movie Reviews with a Twist: BEST TOWN DRUNK -- He's Yours Truly! 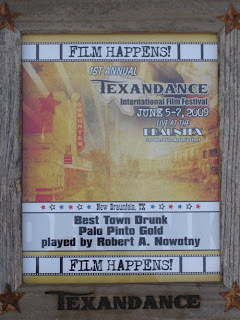 The inaugural Texandance International Film Festival was held this past weekend in the scenic Texas Hill Country town of New Braunfels. Forty-four feature films, shorts, music videos and trailers from around the world were showcased during the three-day event, including PALO PINTO GOLD which was screened right after the prestigious Awards Ceremony. Having attended dozens of film festivals throughout the United States, Canada and Europe, Needtovent staff members were extremely impressed with the quality of the films programmed. Festival Co-Founders Bryce Tumlinson and Vince Koegle are to be congratulated for organizing a successful event -- one that is sure to continue bringing high-quality independent cinematic works to the Central Texas area for many years to come. Among the deserving films and filmmakers recognized by Traildance was Anthony Henslee who received the "Best Director" award for PALO PINTO GOLD. This is just the latest in a string of festival accolades for the light-hearted Western starring Roy Clark and Mel Tillis which was Produced by Needtovent's very own Robert A. Nowotny. However, the highlight of the evening was the ground-breaking award presented to Mr. Nowotny for "Best Town Drunk" -- an admittedly unusual accolade and, based on extensive research by the staff at Needtovent, an award unparalleled in cinema history. Needless to say, Mr. Nowotny is deeply grateful for this esteemed, unprecedented recognition for his unforgettable, albeit short, screen appearance. He has told us his life is now complete.